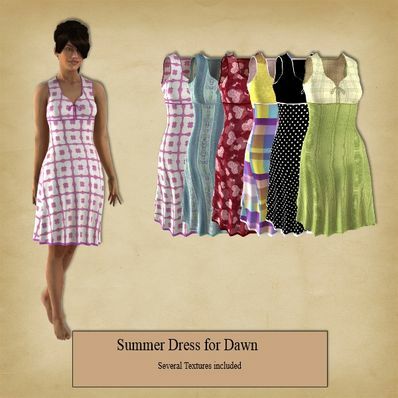 A Summer Dress for Dawn for use in Daz Studio 4.6. Several textures for the Dress. Okay this is just too cute. each outfit is just so amazing. All the textures are so nice and wonderful. A huge thank you. Love your stuff for Dawn. Would like to see more of it! Such a beautiful, but classic dress. Thank you for sharing. Thank you so much for all the lovely clothes you've made for Dawn, she now has a wardrobe to wear in DS. I think she's happy. Very cute dress. Thank you for supporting Dawn.